While I was scouring the internets the other day to find the most delicious bacon news to blog about, I came across a news story from Idaho. It seems that the newscasters were tickled by a local doughnut shop selling bacon doughnuts! As I read the story, I saw that the Idaho shop gave credit to who they said were the originator of the bacon donut, a shop in Portland, OR called Voodoo Doughnut. Of course I wanted to get to the source of this inspired creation so I went to the Voodoo Doughnut site to read more. I found the most amazing place... where doughnuts are more than just tasty snacks. There was a voodoo doll doughnut, doughnuts with candy and cereal on them, doughnuts with grape sugar dust, a doughnut that looks like a blunt and doughnuts that look like naughty bits. And, yes, one doughnut even contains bacon! It's called the Bacon Maple bar and the site description simply says: "Raised yeast doughnut with maple frosting and bacon on top!" Of course I wasn't satisfied and had to email for more information. Enter the most gracious Sara Heise, executive wrangler and wedding coordinator for Voodoo Doughnut, who agreed to do a little e-interview via email about the Bacon Maple Bar. 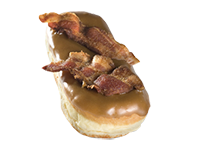 Bacon Goddess: I see from your website you have many unique (and delicious-looking) doughnuts, what inspired you guys to come up with such a variety of tasty treats? VooDoo Doughnut: Cat Daddy and Tres were looking to take an old school doughnut done with pride and add a twist to a dying industry. They are as proud of their classic doughnuts as they are with their crazy ones. They are both creative people who do creative things. Their doughnut creations just came naturally! BG: Since my blog is bacongoddess.com, what I'm interested in, of course, is the Bacon Maple Bar. How did this doughnut come to be created and who gets the credit for this invention? VDD: Maple syrup and bacon is a classic. Putting bacon on a maple bar is a classic with a creative twist. Cat Daddy is the creator of the Bacon Maple Bar. BG: How much bacon is on this doughnut? How did you decide on the perfect ratio of bacon/doughnut? VDD: One slice of bacon, cut in half and placed side by side. No too much, not too little. BG: Bacon on a doughnut might be considered a bit weird by some people, how well does the doughnut do in sales? Do you have regulars who simply MUST have their daily bacon doughnut? Have any bacon fans made a special pilgrimage from exotic faraway lands to sample this doughnut? VDD: We have customers that come all the way from Florida or the UK to try our delicious Bacon Maple bar! Sometimes it is hard to keep on our racks. For some customers, no other doughnut will do! We suggest at least 2 B.M.s a day! BG: Do you have any other plans for doughnuts involving bacon? VDD: We have over 50 doughnuts on our menu. As of now we have no plans in making another bacon doughnut but you never know! For now, we are concentrating on keeping these bad boys always available for our loyal customers. Unfortunately for the rest of the world, Voodoo Doughnut is only located in Portland and Eugene, Oregon at the moment and does not ship their doughnuts. It's a good excuse for a roadtrip, though, don't you think?